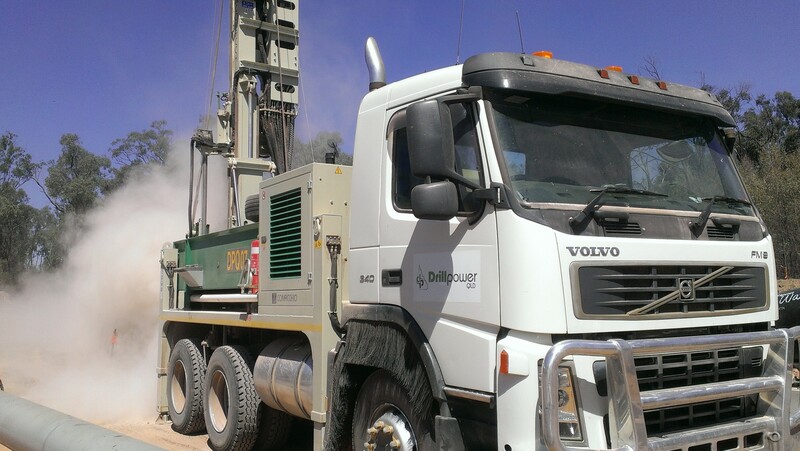 Drillpower QLD and SJ Drilling have the capability to offer air rotary and percussion drilling in various diameters to depths up to 400m depth. Air rotary drilling is sometimes referred to as RAB Drilling, Rotary Air Blast or Percussion Drilling. It employs a blade, PCD, tricone bit or downhole hammer to penetrate the ground. Compressed air is used as the drill flush to lubricate and cool the bit and carry drill cuttings to the surface. Due to the nature of this technique only small chip samples are recovered from the strata that is drilled through. Air Rotary techniques are most commonly used for open hole exploration drilling where chip samples are adequate for logging and sampling. It can also be adopted when drilling through cobbles and boulders when other techniques cannot advance through these kinds of obstructions. Using air as the primary flushing medium is essentially a dry drilling process and is ideally suited to groundwater investigations and water bore drilling where identifying groundwater levels is key. Air rotary drilling can be considerably quicker than other techniques but involves additional large compressors and associated equipment. We would be happy to visit sites and discuss access requirements for our equipment prior to mobilising.